As mentioned in my last Cana post, the late summer menu had just dropped. I stopped in recently to try some of the new cocktails. But first, a friend who hadn’t been before decided to get the best selling drink- the Rum and Coconut Water. Cana buys fresh coconuts almost every day and it’s a sad night when they run out. They crack that baby up and add rum. Simple? Yes, and delicious. 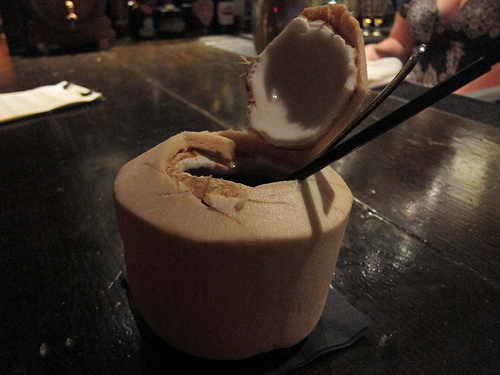 Plus, if you get hungry, you can nibble on the young coconut meat. Cana has renamed cocktail categories. Now there is a new section called “From the Garden.” I mostly concentrated on that page. For my first drink, I decided on the Exile in Paradise (whiskey, tequila, cognac, ripe peaches, lemon, pepper-cumin honey syrup). Oh, it was delicious. It’s times like this I really appreciate living in California with all our fresh produce. 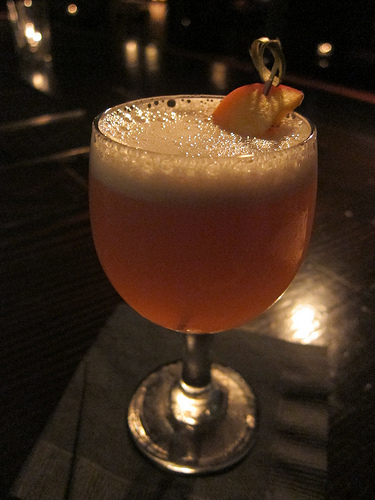 Cana pays tribute to bartender Katie Stipe from Brooklyn’s Clover Club. She came up with Vamos a la Playa, this amazing watermelon cocktail. The Don Q anejo, lime, muddled watermelon, coriander syrup and salt at first sounds like it could be overdone but as GM Allan Katz told me, the surprising specs are just right. It’s not too sweet and very refreshing during our still sweltering nights. What I really like about Cana’s menus are the tributes they give. 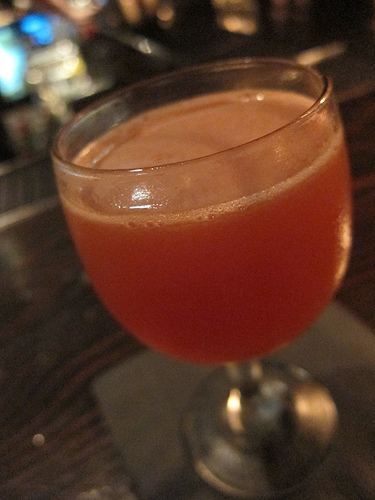 Cana is across the street from Rivera where bartender Erik Lund recently left to head up MessHall. Cana named Grape Expectations for him. The drink with Kappa pisco, champagne grapes, lime and Imbue vermouth sounds like my next drink. The next group of drinks are all beer cocktails. Called “Cold Ones,” this category includes four drinks including a twist on a Last Word called the Curse Word (Tanqueray, Bitter Truth EXR (herbal liqueur), lime, Maraska maraschino, La Chouffe Blonde). And now I know what the beer cocktail I tried before the menu dropped, Black Shack Alley (rhum agricole, Cynar, lime, Cana’s pineapple syrup, Monkey Fist IPA). When I do drink beer, they tend to be dark beers like porters and stouts. I definitely giving the Apache Knuckleduster (rye, Imperial IPA, stout syrup, Luxardo bitter, Meletti) a go next. The last page of the list, “Victory Laps”, are Cana originals that are favorites including the Rum & Coconut Water. What time does the bar open tonight? It might be time for a beer cocktail. This entry was posted in alcohol education, alcohol tasting, bar stories, bartenders, cocktails, history, hot bartenders, la, la cocktails, spirits, the minty and tagged cana, cana rum bar, cocktails, dtla, indian summer menu, la cocktails, late summer cocktails, rum, the minty. Bookmark the permalink.